Be the first to share your favorite memory, photo or story of Cherry. This memorial page is dedicated for family, friends and future generations to celebrate the life of their loved one. 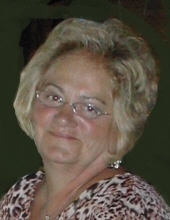 Butler – Cherry Rita (Reed) McFarland passed away April 1, 2019, surrounded by her family and friends when she was called home at St Elizabeth Healthcare, Ft Thomas. Cherry was born March 11, 1951 in Maysville to the late Allie Lebus and Clara Christine Tull Reed. She was a member of the Dover Christian Church, had worked at Jones Elementary School and then at Inland Container and was owner of the Cherry Tree Restaurant. Cherry was a person who truly enjoyed life. Cherry is survived by her children Shauna Christine McFarland Short (Freddie), James Alan McFarland, Anthony Earl McFarland, grandchildren Brycelyn Short, Cayla McFarland, Chaston McFarland, Fred Short, Jr., Kellie Smith, seven great grandchildren, two sisters Barbara Ann Reed Askren, Andra Myrlea Reed Tolle and several nieces, nephews, great nieces and nephews. Services for Cherry will be 11 a.m. Saturday April 6, 2019 at Brell & Son Funeral Home with Pastor Clark Castle officiating. Burial will follow in Rosemont Cemetery. Active pallbearers will be James McFarland, Anthony McFarland, Chaston McFarland, Jay Staley, Danny Miller, Chris Askren, Jeff Askren, Tristan Palmer. Honorary bearers will be Freddie Short, Sr., James David Caproni, Randy Dugan, Jake Askren, Raymond Ashcraft, Mike Poe, Mike Moran, Gene Bolden, triplets Jakob, Aidan and Reed Staley, Mason Askren and Freddie Short, Jr.
To send flowers or a remembrance gift to the family of Cherry Rita McFarland, please visit our Tribute Store. "Email Address" would like to share the life celebration of Cherry Rita McFarland. Click on the "link" to go to share a favorite memory or leave a condolence message for the family.